Italia goes on display at Ryubo from Tuesday. The tastes of Italy, along with a look at Italian kitchen goods and accessories, will be featured beginning Tuesday at Ryubo’s Italy Exhibition in downtown Naha. This will be the 8th time Ryubo has staged an Italy Exhibition. Admission is free for the week-long exhibition, which runs through the 21st on the 6th floor of the department store. The exhibition is open daily 10 a.m. ~ 8:30 p.m., except on the final day, when the event closes at 5 p.m.
Ryubo is inviting Okinawa to visit, and to try some of Italy’s best dishes such as pizza and pasta. There will also be kitchen goods on sale and Italian made accessories. 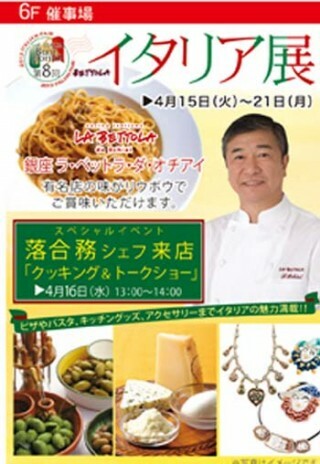 On the 16th there will be a special event welcoming Tsutomu Ochiai for a cooking and talk show. He is the owner and chef of the famous Italian restaurant La Bettola de Ochia in Ginza, Tokyo. Ochiai is also the current chairman of the Japan-Italy Food Association.